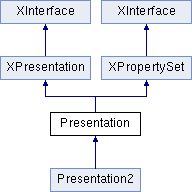 This service is a presentation that is available from a PresentationDocument via the XPresentationSupplier interface. This is the standard interface for access to the properties from this service. lets you start and stop a presentation. It also gives you access to the more advanced features, like rehearse timing and the live modes. If this string is not empty, it contains the name of a customized show that is used for the presentation. If this string is not empty, it contains the name of the page where the presentation is started. If this property is set to TRUE, the window of the presentation is always on top of all other windows. If this property is TRUE, all pages are changed automatically. This overrides the properties of the pages. If this property is set to TRUE, the presentation is repeated endlessly. If this property is set to TRUE, the presentation runs in full-screen mode. With this property, you can set the presentation to live mode. Implementations that have no live mode capability may ignore this property and always return false. If this property is TRUE, the mouse is visible during the presentation. is the duration of the black screen after the presentation has finished. If this is set to 0, no black screen is shown. If this is set to TRUE, the Navigator is opened at the start of the presentation.